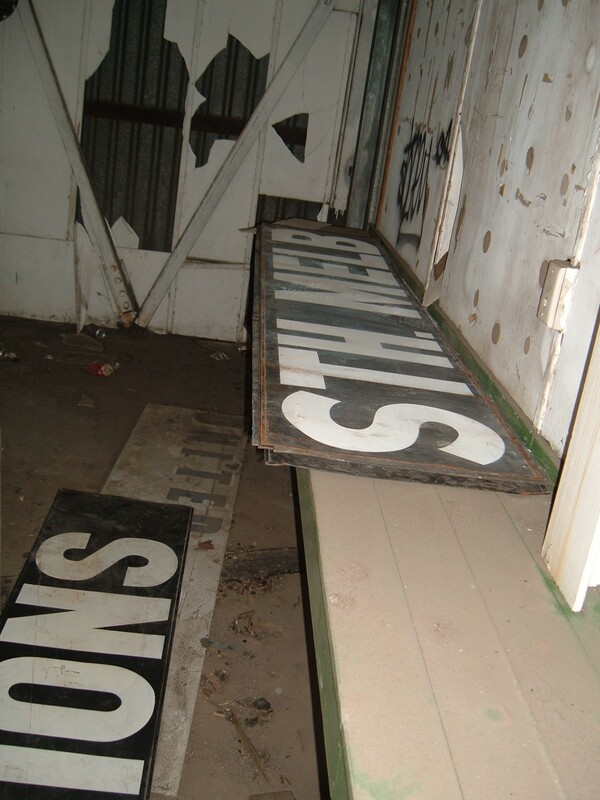 Photos by John Carr of the Holyboot Football Emporium. The ‘300 WELL DONE’ refers to Chris Grant’s milestone. 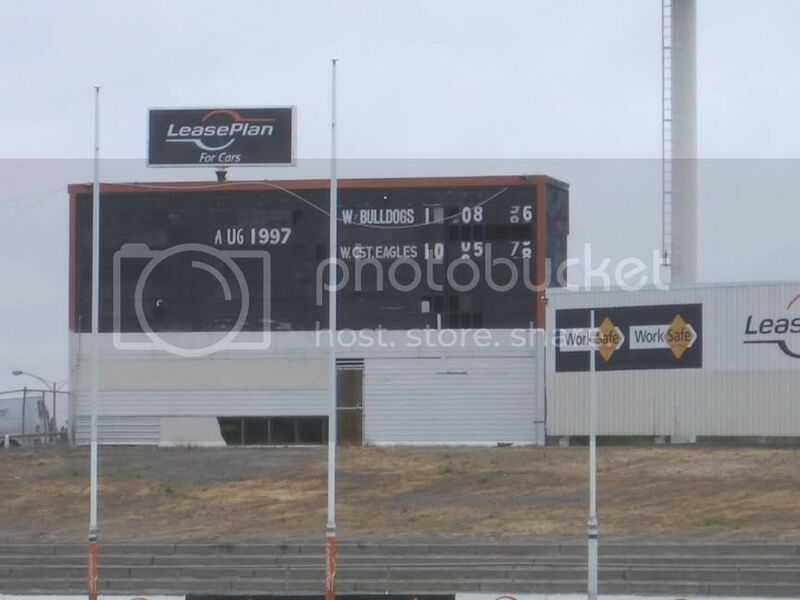 The last Whitten Oval (or Western Oval) scoreboard stood in the forward pocket at the West Footscray Station end of the ground from the 1970s to its demolition in November 2005. 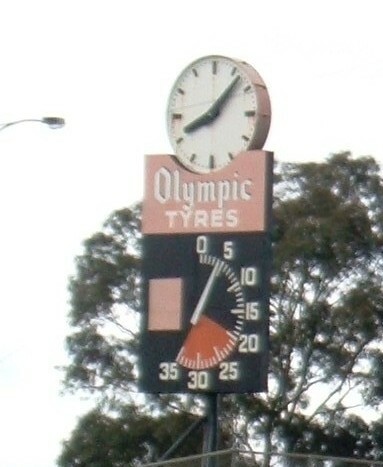 The Olympic Tyres clock was probably as well-known as the scoreboard. It was not dem- olished and is apparently in storage. 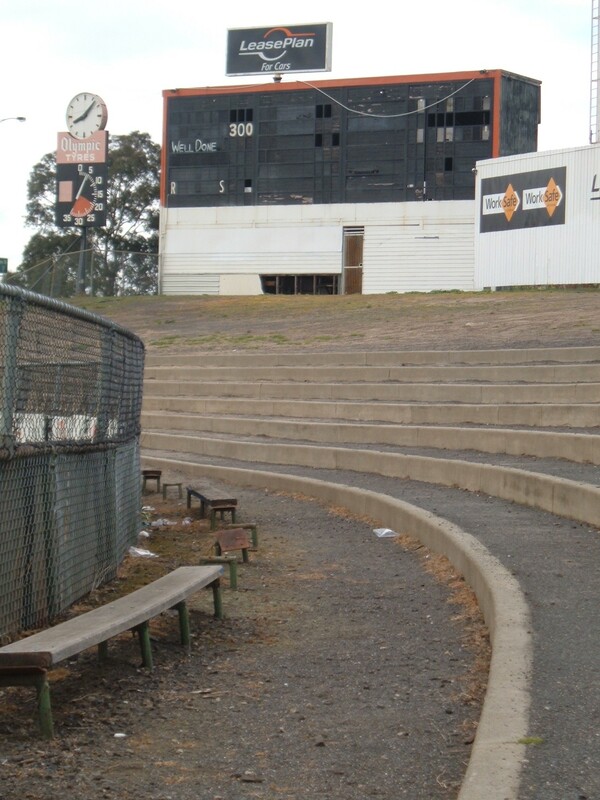 The clock was designed by Frank Soraghan, a West Footscray rover who lived four blocks from the Western Oval. His daughter Kerrie tells the story on The Footy Almanac website: ‘Dad didn’t get ‘drafted’ to the team his family naturally supported; when he won the Footscray and District Best and Fairest as a 17-year-old he was ‘asked down’ to train. The local paper was excited about the prospects of the young rover, who they called a ‘natural’ with a ‘brilliant future’. ‘But Dad’s timing wasn’t the best. He came to the club in 1955, right after that solitary premiership. It was a rare strong era, a champion team that was hard to break into. Dad got named on the bench a couple of times, but in those days, you didn’t get to come on unless there was an injury. ‘Finally, family legend has it, the young bloke got told by Charlie Sutton that he would start in the 18 that week. Riding his bike home from his job at the Olympic Tyre Factory, the wheels somehow got caught in the Maribyrnong tram tracks. In a twist befitting a Leunig cartoon, Dad fell off, breaking his ankle. The club traded him to Tongala at the end of the year. The future of the promising young lad was over before it began. 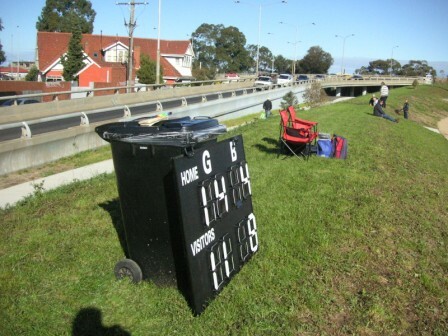 When Western Bulldogs affiliate Williamstown played Coburg in a VFL game a few weeks back at the Whitten Oval the Williamstown scoreboard bloke borrowed a portable scoreboard from amateurs team Williamstown CYMS and a rubbish bin from outside the Western Bulldogs Elite Training Centre. 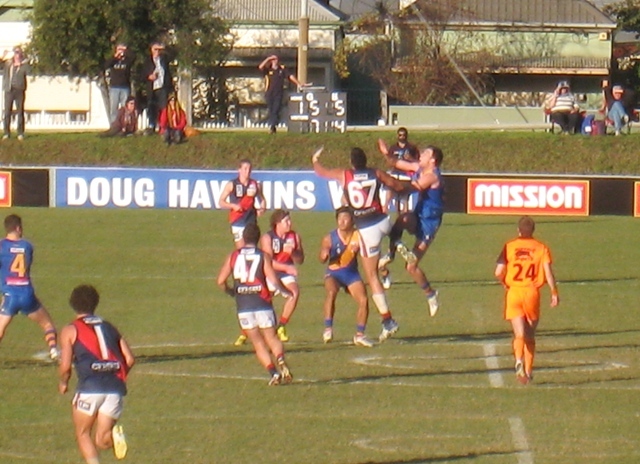 He parked himself on the Doug Hawkins Wing and propped the scoreboard up against the bin. The bin doubled as a desk. 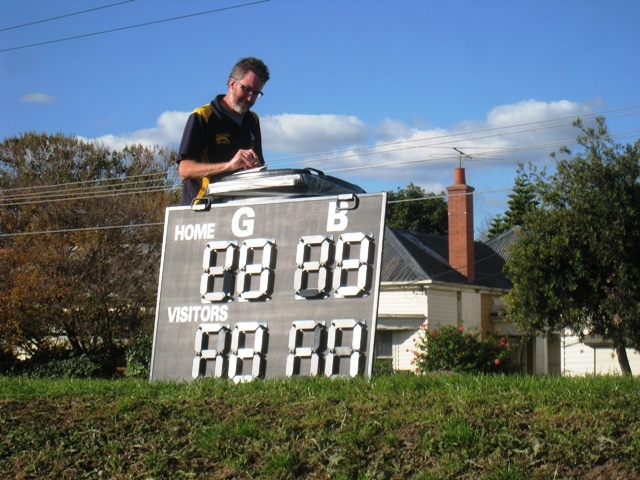 At a meeting of the Footscray Council on Tuesday the city engineer (Mr. A. E. McCausland) submitted plans for a new scoring-board at the Western Oval. He said that the existing scoring board, which was not the property of the council, was unsatisfactory. The new board would cost approximately £150 and provision would be made for the inclusion of a clock. The mayor (Councillor F Hester) opposed the proposal. 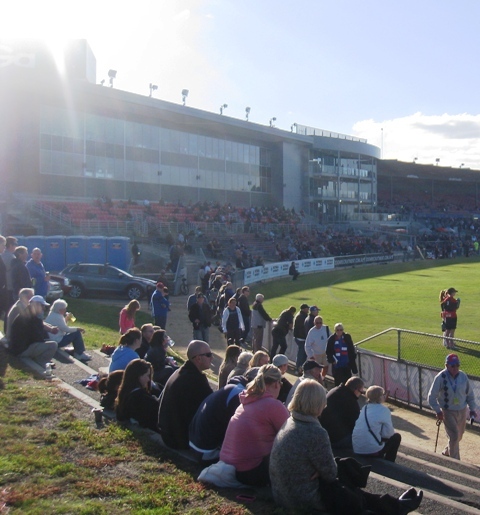 The council, he said, had already spent a large sum on improvements to the oval and if a new board were needed the football authorities should do something to help themselves. It was decided to take no action. Many, many thanks to John Carr of the Holyboot Football Emporium and to Kerrie Soragahan and her Footy Alamanac story. Fantastic stuff Vin and thanks for the shout out. Was lovely to meet briefly on the Dougie Hawkins wing! Great work on the old Olympic Tyres clock…great to get some background on that sought of stuff! And very creative with the bin by the way!